Happy November, friends and fellow quilters! 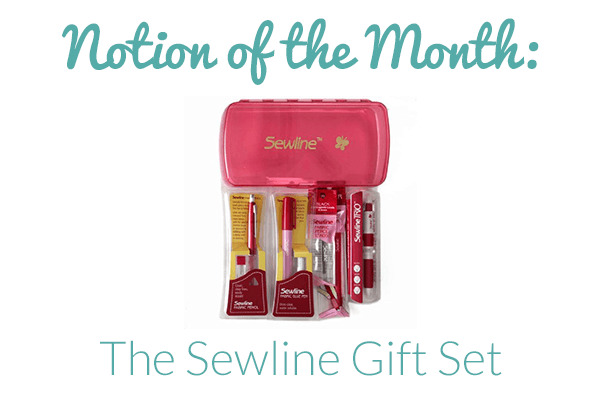 This month’s notion of the month is the Sewline Marking Utensil Gift Set. A new month means it’s time to review a new quilting notion, and this one is fantastic. Actually, to me it’s indispensable. My absolute favorite line of marking tools is the Sewline brand. I’ve been using Sewline marking tools for several years now and they are definitely my “go to” marking utensil. I’ve never had issues with them staining or marring my fabrics. They are pretty. (A high priority!) and their pink and while color makes them really easy for me to find when my sewing room turns into a huge mess! I will have to say that the downside is that they are not exactly cheap. But this month’s Notion of the Month is a GIFT SET, which combines four Sewline products into a nifty, pretty, pink storage container. Buying them in the set like this will save you a little money and the storage case will help keep your creative space organized. So, head on over to Amazon and pick one up for yourself, and while you’re at it, you may want to grab a few for any quilters you might have on your gift list! Christmas is right around the corner!